That's a lovely site you've put together. I have recently been (trying) doing some family research. Is there any chance that someone will remember my Grandad? George Scott he lived at the bottom of Heath Green Road, off the Dudley Road. He died sometime in the late 60's, and my uncle Bob stayed at the house after he went. Any info. or stories of him or his family would be appreciated. My Mom was his daughter Marjory, she marrid my Dad during the War. I am now living in Swansea, and can be reached on 01792 578309, or E-Mail kitwarwick@yahoo.co.uk. Thank you for the memories your site has brought back. 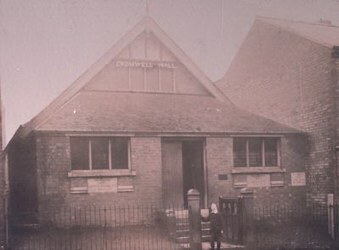 CROMWELL HALL Was opened in 1894 and remained active for about 100 years. At its peak, up to 400 children attended Sunday School each week. I am sending you a photograph of the coronation party held for the folks of Heath Green Road in Cromwell Hall. I think the same photograph is on Cromwell Hall's site but I can assure you this copy is mine. I am the little lad with the beard drawn on my face with eyebrow pencil the reason being that I had just won firsr prize in the fancy dress competition dressed as a chef. the prize was a clockwork train set. I had changed from the chefs outfit but left the makeup on. It does not seem fifty-six years time flies when you are getting older don't you agree. If anyone recognises themself could they e-mail me. I would love to send photo's of the old days, but sadly all such pics disappeared when my mother re-married and my grandmother's collection went elsewhere in the family. However if you ever get enquiries regarding the inhabitants of Wood Green Road during the 1940's please pass them on. Also any information regarding Cromwell Hall. In fact anything. I read the site every day. I was born in 1946 and I was bought up in Heath Green Rd. and lived there until I married in 1970. My father had lived in Heath Green Road since he was about two years old but he had spent many years away in the Royal Navy ( I believe his first voyage he was away for over two years on what they called the China station). He met the woman that became my mother when he was on leave during the war, they married and rented a house opposite my dads parents in the first terrace on the left going down Heath Green Rd. My dad was named Walter but I think most of the folks knew him as POP. I started City Road Infant school (1951-1953) when I was five years old and can remember that day as if it was yesterday, I started part way through the term because I had been in hospital, my sister Lyn who also attended that school said she would see me at playtime but her class was delayed having to see the nit nurse so no Lyn, My reaction I lost it and no one could calm me down and I fought the teacher Miss Wellington tooth and nail. 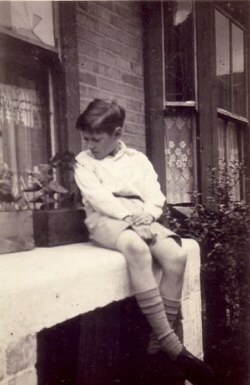 Seven years old off to Summerfield Juniors (1953-1957). My first teacher Miss Prince a lovely middle aged lady who spoiled us and gave us a sweet every Friday. Then it was a Mrs Smethhurst in the second year , third year a Mr Downing or Dowling who I liked very much, then the final year a Mrs Aldridge. Other teachers I remember were Mr Moss who taught the top class and every pupil in the school was terrified of him a Mr Jones,Mr Parry and a Mr Wilson and the headmaster Mr Reece. In 1957 aged eleven I went to the brand new school Portland Road Edgbaston, not in your area Ted but quite a few kids from Winson Green, Ladywood and Handsworth went there and I finally left in 1961. Sunday school was Cromwell Hall in Heath Green Rd the place were I got my head stuck, yes I was about four year old and was playing in the terrace with my sister and her friends and I wandered off down the road to the chapel (Cromwell Hall). there was a bunch of older lads playing in the area at the front having squeezed through a gap were one of the iron railings was missing I decided to squeeze through as well but tried to get through, were the railing was in tact, my head was stuck. The next thing I knew my mom was standing shouting someone get the fire brigade, what did I do just turned my head and walked out. Cromwell Hall no choice every Sunday afternoon off we had to go with a penny for the collection, I think it was to give our parents a rest. Then once a year anniversary best clothes and follow the band around the local streets. Christmas party take your own cup dish and spoon and the highlight was a orange and apple on the way out. The Sunday school outing a day trip to the country or seaside always on Gliderways coaches. The biggest event at Cromwell Hall was in 1953 the coronation but it rained all day, I did win first prize in the fancy dress I was a chef. but what I remember most about the coronation was the street decorations not only our street but every street. Each Sunday evening for many years the Salvation Army Band used to come and play in the middle of the road.The man that played the bass drum would rest it on a wooden stand, well just before they stopped to pray I would run up our entry into the kitchen grab my moms boiler stick,by the time I got back the Sally Ann would be quiet in prayer so I would sneak up behide the man with the drum and hit it as hard as I could and be off. I was about six years old at the time it,'s funny how those little things stay in your mind. We only had one shop in Heath Green Rd. and that was the off licence or better known as the outdoor on the corner at the bottom but in Cuthbert Road opposite the bottom of Heath Green Rd. there was a cobblers shop run by a old fellow named Fred and he used to take bets for a bookmaker it was before betting shops was legal. At the top on the right going down there was Brunners the bakery and they made nice cakes and had a shop on the corner for a while. I remember the manageress used to give us kids a bag of cakes every so often. The days I am talking about we could play in the road for hours and see very few cars come down, in fact if we saw a car parked we wondered who had there rich relatives visiting them. We did have the milkman and the breadman but they had horse and carts then. Life was hard but fun in those days no bathroom dad had to bring the tin bath up from the cellar once a week Outside toilet very cold in winter you did not hang about. No hot water boil a kettle and strip in the kitchen for a wash Washing days my mom would start before I went to school and be just finishing when I came home at night. Was they the good old days? I ask myself. I have plenty more stories I could tell you but some tales I don't know if I dare I could get myself and others in a spot of trouble we were little B---ers in them days. I would like to hear from anyone who knew me please Email me. 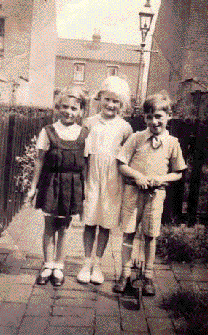 I was very interested to discover your web site as I was born in 1930 at 4/16 Heath Green Road, Winson Green. I attended Dudley Road Infants and Junior schools, a period which was interrupted by the outbreak of WW2, when I was sent for a fairly brief period to Cromwell Hall, which served as a temporary school! I followed this with attendance at Barford Road School and finally, Handsworth Technical School. I left Heath Green Road to move to a nearby address at 336 Dudley Road in 1946 and was called up into the R.A.F. in 1948. I remember taking part in a Fancy Dress competition at Cromwell Hall in 1937? which was part of the Coronation celebrations. I also remember my home being narrowly missed by a flying bomb, during an air raid in the early part of the war, the same bomb hitting and exploding on a neighbour's house. Friends in the neighbourhood included Frank Williams, Arthur Whitehead, Arthur and Teddy Darby, Margaret Probert, Jean Phillips, John Crathorne, John Phillips etc. I'm attaching an old photo taken during one of my weekend passes, in nearby park at Warley. Hope that someone remembers me. I was born in Dudley Rd. Hospital in 1944, and lived the first couple of years at my Grandads house in Heath Green Rd. I can remeber getting off a tram in Brum City centre when I was about 4 years old. But what I am trying to do is find out about my Grandad and Grandma, Geaorge Scott who lived in Heath Green Rd. I know he was a Prison Visitor and a life-long Scouter.